Sanjay Gupta joins forces yet again with Sanjay Dutt to bring us a gritty fact based film about Mumbai Gangster Maya Dola (portrayed in the film by Viveik Oberoi). The one thing that is a constant in any Sanjay Gupta produced or directed film is that one can have high expectations with the music. From Kaante, to Musafir, to Zinda, music fans have been treated to diverse and at times groundbreaking music. 2007 has been the year that we have literally been bombarded by music from music director’s Pritam and Himmesh Reshammiya, so it would be refreshing to listen to something different than what has become the standard pattern that Hindi film music has recently found itself in. The question on my mind, is, “Has there been anything truly groundbreaking?” I’m not convinced that there has been, but let’s see if “Shootout at Lokhandwala” can bring us a breath of fresh air. The movie is produced by White Feather Films, the production house that comprises of Sanjay Gupta and Sanjay Dutt. The cast consists of the already mentioned Viveik Oberoi plus Amitabh Bachchan, Sanjay Dutt, Abhishek Bachchan, Suneil Shetty, Arbaaz Khan, Tusshar Kapoor, Shabbir Ahluwalia, Rohit Roy, Aditya Lakhia, Aftab Ahmad Khan, Neha Dhupia, Dia Mirza, Aarti Chhabria, Amrita Singh, Rakhi Sawant, and Ravi Gosal. 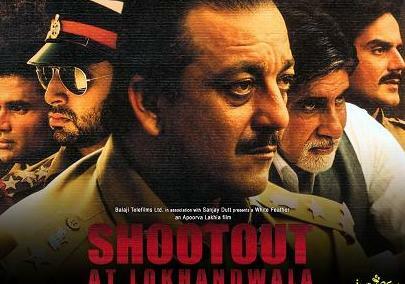 Shootout at Lokhandwala is based on the real life police shootout at the Lokhandwala Complex in Mumbai during the summer of 1991. Apoorva Lakhia who last directed “Ek Ajnabee” resurfaces to direct the film that is essentially a six-hour shootout tale told in three hours. It will be interesting to see how the music is integrated into this tense action packed movie. So pick up your six shooters and start hanging out with the Mumbai Bhai, we have “apun ka review” to get to. Instead of going the usual route of hiring one music director to create the standard four to six songs, Sanjay Gupta has gathered together an eclectic mix of talent. Anand Raj Annand (who comes out of hibernation after the so-so soundtrack to “Aryan”), Mika (brother of Bhangra mainstay Daler Mehndi), Strings (who had the superhit track from “Zinda”, “Yeh Hai Meri Kahani”), Biddu (best known for producing smash hits with Nazia Hasan), and Dr. Palash Sen (lead singer of hit band Euphoria) have each, contributed tracks for this soundtrack. Anand Raj Anand starts off the soundtrack as music director and vocalist with the track, “Mere Yaar” which is the first of two “Beedi” (from the movie, Omkara) inspired songs on this soundtrack. The song is raunchy and catchy. These are two qualities that the so-called “front benchers” will love (and so will the rest of us). Unfortunately, like many of Anand Raj Anand’s compositions, there is something that is too familiar about this song. It’s like visiting an old friend and sharing fond memories. There is the comfort of familiarity, but is there anything new? Joining Anand Raj Anand in this raunch fest is none other than beedi girl Sunidhi Chauhan. She really is the highlight of this song, as her vocals raise this song from mediocre to something better. The song will probably be well received because of the combination of the driving beat, thrusting lyrics (by Dev Kohli), and the surety that the song will focus on a scantily clad woman (in this case Aarti Chabaria ) dancing suggestively. Musically, it’s the scantily clad village belle meets techno in all the right places. Nothing groundbreaking, but strangely catchy, it’s a probably a “SHOOTOUT (hits the spot)” track. (But really, critically it shoots “BLANKS”). Arguably the best song on this soundtrack, “Akhri Alvida” comes courtesy of Pakistani group Strings. It’s not as strong as their previous Sanjay Gupta/Dutt collaboration (“Yeh Meri Hai Kahani” from “Zinda”), but it’s probably the one breakout hit of this album. The song begins with a haunting piano solo and as the keys play softly over your ears; you are hooked into the beauty of the melody. Anwar Maqsood’s lyrics blend in perfectly with the music and vocals. From a soft start to the percussive use of electric guitar the song never lets up in its intensity. The song is truly beautiful in a melancholic way. This one will go to the top of the charts, and is a “SHOOTOUT” track. Listening to this song, one can’t help but wonder when the next Strings album will come out. “In the Mumbai, all over India…. we are the Bhai’s’…we are the Bhai’s’…”, are some of the lyrics from the third track “Ganpat”. Honestly, after hearing this track, I felt like a “Bhai”. All the Mumbai Bhai’s’ have finally found their anthem. The song’s vocals and lyrics are by Mika (best known as the bhai of Daler Mehndi). He sings the typical Hindi dialect as spoken by these gangsters. The guys are drunk, and bragging about their exploits. Still, other than the underworld music fans, I don’t think this song will really resonate with normal law abiding citizens. It would be a crime to make this one a hit, as it’s just not that good. The song ends with a question, “Yeh Ganpat kaun hai?” I feel like asking the music director of this track the same thing as I get robbed by some Bhai’s’. The track shoots BLANKS! What a missed opportunity, since the gangsters got away with this track. Wait a second; am I listening to “Omkara” or “Shootout at Lokhandwala”? The next track, “Unke Nashe Mein” sounds like a clone of “Beedi”, except it doesn’t have the sultry vocals of Sunidhi to bring it to the next level. Mika and Sukhwinder Singh try their best with the material they are given, but it’s not enough. Sanjay Gupta turns lyricist but shouldn’t quit his day job. It’s interesting that the two Anand Raj Anand tracks both sound like parts of the same song. This is one to be forgotten and shoots BLANKS all the way. The next track, “Live by the Gun” makes me feel like I am in one of those old Sergio Leone/Clint Eastwood westerns. The music, lyrics and vocals are by Biddu. I don’t know what he’s been up to in recent years, but this will not be the comeback song that he was hoping for. I feel like grabbing my cowboy hat and riding off into the sunset on my horse. But wait a minute; this movie takes place in Mumbai, India. Aha! It’s about our desi cowboys! It’s quite an interesting song, with a nice “put em to sleep” feel to it. This one will probably play in the background and that’s the best way to describe it. It’s generic background music. This one is a total MISFIRE. The sixth track, “Sone de Ma” is a sweet melancholic song in the Euphoria house style. If I had never heard another Euphoria song, then I would think this was a really good piece of music. As it is, Dr. Sen and his bandmates do not create anything truly original. I guess we can say that the song is a bit of fresh air since it utilizes the Ghatam (a mud pot) as its’ main percussion and a Shehnai (wooden reed instrument) interlude with no use of synths. The well-written moving lyrics are by Deekshant Sherwat. It’s a strong offering by Euphoria and I don’t mean to take away from the strength of this track, but it is totally in the Euphoria style that we have heard throughout the years. They excel at rustic sounding songs, and for that I have to say this one is a “SHOOTOUT”. 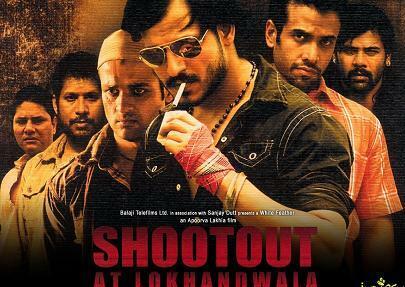 So let’s take lock stock and barrel of what we have so far with “Shootout at Lokhandwala”. We have one outstanding track “Akhri Alvida” by Strings, one very good track, “Sone de Ma” by Euphoria, two so-so tracks by Anand Raj Anand, a perplexing “Live by the Gun” country track by Biddu and the bhaitastic “Ganpat” by Mika (translation: what a led down yaar!). The album ends with the now obligatory batch of remixes. First we are hit with the remotely amusing remix of Ganpat that captures snippets of a gangster’s life. The track will probably be a hit in the “gangsta” lounge (sorry, couldn’t resist). The second remix is of “Akhri Alvida’ and it lessens the impact of the song making it more frivolous, which is probably best for the dance floor. The final remix is an unnecessary remix of “Unke Nashe Mein” which strangely makes the song even more forgettable. 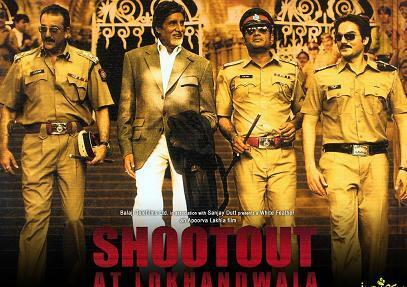 It was an interesting idea to bring together so many diverse musical talents for “Shootout at Lokhandwala”, but after the highs of soundtracks like “Kaante”, “Musafir” and “Zinda”, one can’t help but be disappointed at the lack of creativity on this album. The only two songs, which have any kind of lasting impact on the listener, are “Akhri Alvida” and “Sone de Ma”. Credit should be given to Strings and Euphoria for saving this album from being the first disaster from Sanjay Gupta’s White Feather Films production house. Add the two songs to your playlist and forget the rest, as this shootout seems to fire more blanks and more often than not, fails to hit the bulls-eye.